MOR 101.9 Manila currently has 2 million followers on Facebook. This however is still 1 million plus lesser than that of close rival Love Radio 90.7 Manila. Their fiercest competitor has 3.3 million or 3,351,624 followers as of this posting. It its understable though since Love Radio has been around for a while. While MOR 101.9 has been on the air only since 2013. 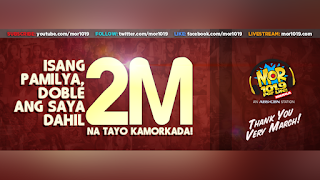 Still with 2 million likes, that is a feat for the Kapamilya station. Who knows they might surpass Love Radio or never at all. Still congratulations!